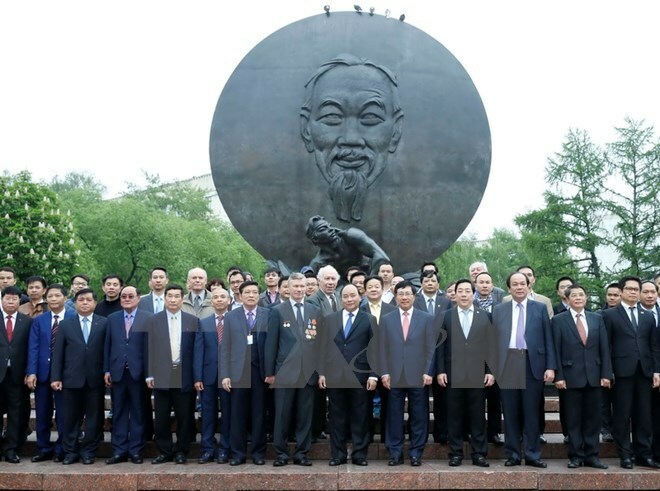 Moscow (VNA) – Prime Minister Nguyen Xuan Phuc left Moscow on the afternoon of May 19 for Sochi to attend the Commemorate Summit to mark the 20th anniversary of the ASEAN-Russia dialogue relations. Earlier, he laid a wreath and planted a tree at the President Ho Chi Minh statue in Moscow on the occasion of the late leader’s 126th birthday (May 19). During his official visit to Russia from May 16-19, the Prime Minister held talks with his Russian counterpart Dmitry Medvedev. They then witnessed the signing of eight cooperation documents between the two countries. The Vietnamese Government leader met Speaker of State Duma Sergei Naryshkin and Speaker of the Federation Council (Upper House) of the Parliament Valentina Matviyenko. He also received President of the Russian Communist Party (RCP) G . Zyuganov, and representatives of the Russia-Vietnam Friendship Association and the Association of Russian Former Military Experts. During the talks and meetings, the two countries’ leaders reaffirmed the determination to strengthen the Russia-Vietnam comprehensive strategic partnership, while discussing numerous measures to boost the bilateral ties to meet the two peoples’ long-term interests. They agreed to exert efforts to address the reduction in bilateral trade through facilitating import-export activities, intensifying trade promotion, and bringing into full play the free trade agreement (FTA) between Vietnam and the Eurasian Economic Union and other FTAs Vietnam joins. During his visit, the PM visited Zarubezhneft and Gazprom, two of the largest oil and gas companies in Russia.